The Grand Canyon was on our trip list, and given the short 2 hour drive from Vegas, with the Hoover Dam in between, we knew we could easily make a West Rim trip happen with our four boys (ages 15, 13, 10, 7). We were greeted by a smiling Craig Talieje, our guide for the Legacy VIP Tour, offered at the West Rim. Craig is one of 2600 remaining Hualapai Tribe Members. The Hualapai, “People of the Tall Pines”, have lived in this region for generations. 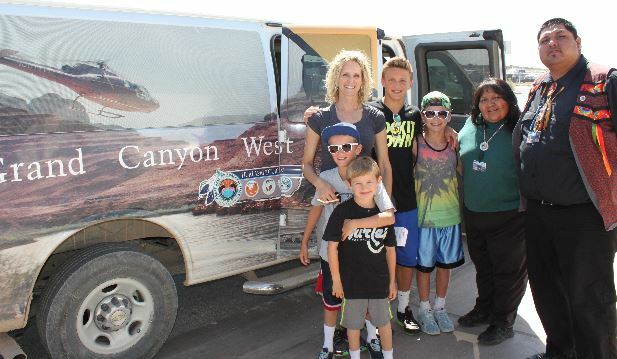 By their developing a few tourist sites along this rim of the canyon, the Hualapai are able to help pass along their Tribe’s traditions and history to their children. The West Rim opens doors for jobs, and the revenue allows the tribe to create other opportunities for this nation’s people. There are three stops at the West Rim. The crowds seem to be lighter in the morning, so if your Vegas Night ends early, get up and go!!! 1. Guano Point–this was my favorite. No hike needed for amazing 360 views, but if you want to scamper up an easy rock peak, your jaw will come even closer to hitting the ground. 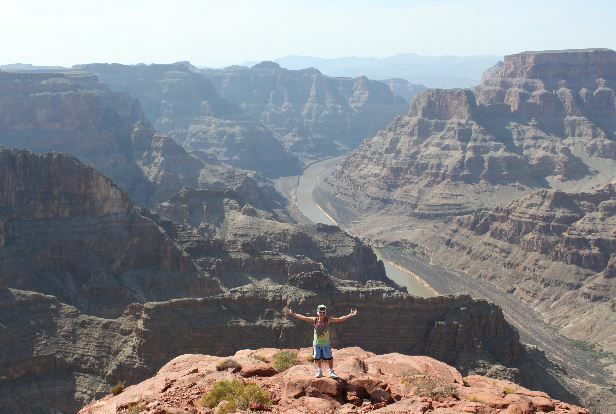 With the Colorado River below, and massive canyon drops on three sides, it is spectacular! It’s also interesting to see the remains of a bat guano mine trolley that spanned the canyon to the cave on the other side. 2. 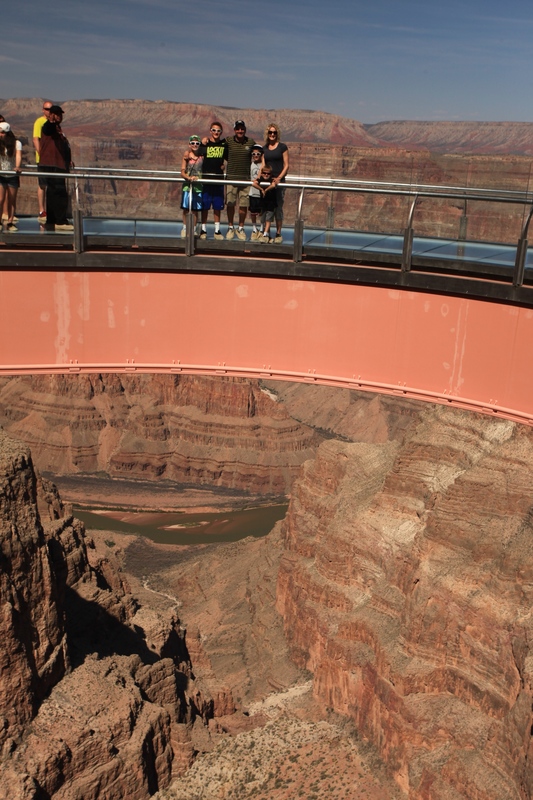 The Skywalk–Definitely worth the experience! The clear glass path in the middle of the walkway for the bravest of the bunch! You can look over 1,000 feet straight down! WOW! Or, for me, and other “more faint of heart” you can grab the handrail, and walk your way around on the fogged glass along the side of the skywalk. They have photographers that will gladly capture your experience for you! Once again, it seems the earlier you get there the better, to minimize the line for this. Don’t forget water, and consider the VIP tour…it’s like a Fast Pass to the front of the line (including your own van to zip you to these spots, and a native tribe member to learn about the Hualapai history). Our guide gave us a sneak peak at Quarter Master point, it’s not open to public…yet…but could be the possible home of a future zipline feature??? That will be one heck of an exhilarating ride! 3. Hualapai Ranch–resembles an old western town. BBQ ribs dinner, with beans, rice, veggies, corn bread and cookies hit the spot. The boys shoveled in their food so they could see the magician (who was amazing), do some archery, rope and tie, and pistol shooting. If we had more time, we would have loved to do the horseback ride. They also offer helicopter tours that take you below the rim of the canyon! We didn’t sleep here, but it looks like across the board, you will find simple, clean, amenities. No fancy fair, but adequate, and an interesting, fun change of pace for anyone from out of the area. Note: Once you lose cell phone coverage on your drive in…you won’t get it back til after you leave! And, the construction of the paved road all the way to the West Rim should now almost be done which helps with the dust.